The third or final sets of molars people get in their late teens or early twenties are known as wisdom teeth. 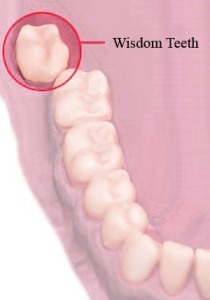 In most cases, wisdom teeth appear misaligned. This is when removal is required. Because, they cause problems such as crowding, damage to the adjacent teeth, jaw bone or nerves. When the wisdom teeth fail to erupt completely, it is known as impacted wisdom teeth. Mismatch between the size of the teeth and the size of the jaw causes impaction. Impacted wisdom teeth may not show any signs or symptoms until it starts communicating with the mouth. The main symptoms of impacted wisdom teeth may include pain, swelling, bleeding of the tissue overlying the tooth etc. Lack of space in the jaws for the new teeth is the main cause for impaction. As the wisdom teeth erupt last, it is difficult to get sufficient space in the jaws. This paves way for impacted tooth/teeth. Usually, the diagnosis of impacted wisdom teeth is done clinically if enough of the wisdom tooth is visible to determine the depth, angulations etc. If the clinical trial alone cannot assess the tooth, the dentist may also suggest other diagnostic methods such as panoramic radiograph or cone-beam CT. Extraction is the main treatment for impacted wisdom teeth. The procedure is suggested when it starts to show symptoms. It depends on the depth of the impaction, angle of the tooth etc. 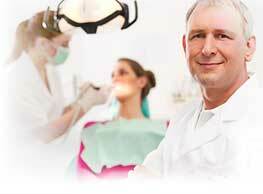 The procedcure will be carried out under local anesthesia. There will be pain and swelling for two-three days after the procedure. Complete recovery may require 4 to 6 weeks of time. Risks and complications may include infecion, swelling, dry socket etc. Proper follow-up care is needed for fuller recovery after the procedure.